India vs West Indies 1st test being played in Saurashtra Cricket Association Rajkot from 04 Oct 2018. 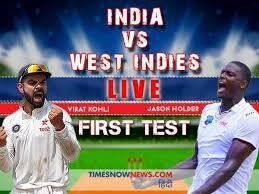 This is the 1st test match of West Indies tour of India series of 2 test, 5 ODI and 3 T20 matches. Hi, friends I am Gyan Ranjan. In this blog post, you will get Ind vs WI live cricket score, memorable moments, and about Prithvi Shaw did a century in debut match. Prithvi Shaw, KL Rahul, Cheteswar Pujara, Virat Kohli(c), Ajinkya Rahane, Rishabh Panth, Ravichandran Aswin, Ravindra Jadeja, Kuldeep Yadav/Shardul Thakur, Umesh Yadav, Mohammad Sami. Kraigg Brathwaite, Kieran Powell, Shai Hope, Shimron Hetmyer, Roston Chase, Shane Dowrich(wk), Jason Holder(c), Devendra Bishoo, Keemo Paul, Sherman Lewis/Jomel Warrican, Shannon Gabriel. Prithvi Shaw in his debut match started the inning with KL Rahul. KL Rahul lost his wicket without scoring but Prithvi Shaw played an amazing inning and scored 134 in his debut match in which he smashed 19 boundaries. From this match, Prithvi Shaw proved that he is a talented and capable player. He played very fast like ODI and scored 100 with the strick rate 100 but lost his wicket at individual score 134 runs for which he faced 154 delivery. His inning is a great sign for the future of Indian Cricket Team. Pujara also played great inning but could score 86 runs before losing his wicket. Virat Kohli also played an inning of 139 runs. Rishabh Panth played a blasting inning of 92 runs in which he smashed 5 boundaries and 5 sixes. Ravindra Jadeja also did a century in this match. So in this way, 3 players of India got the century in the 1st inning of Ind vs WI 1st test match. Devendra Bisoo got maximum 4 wickets in this match, Sherman Lewis 2 and other 3 bowlers of WI got the 1-1 wicket. India declared 1st inning at the score 649/9 in the 2nd day of this match. The Indian bowlers didn't give the chance to WI to build his inning to chase a big total 649 and have taken wickets in the regular intervals. West Indies could score only 94 runs for the loss of 6 wickets at the end of the 2nd day. Shami got 2 wickets, Jadeja, Aswin, and Kuldeep got the 1-1 wicket. West Indies trials 555 runs at Day 2 stump. WI all out at 181 in his 1st inning. Ravichandran Aswin got maximum 4 wickets in WI'S 1st inning. West Indies started to play the 2nd inning as f/o, but all-out at 196 due to best bowling performance of Indian bowlers. Kuldeep Yadav 5, R Jadeja 3 and Aswin got 2 wickets in the 2nd inning. So India won this Ind vs WI 1st Test by inning and 272 runs.